Vertigo Wave mk2, Virtual subtractive synth from Boscomac. Boscomac has released version mk2 of its free Vertigo Wave emulation of Ondes Martenot for Reaktor. 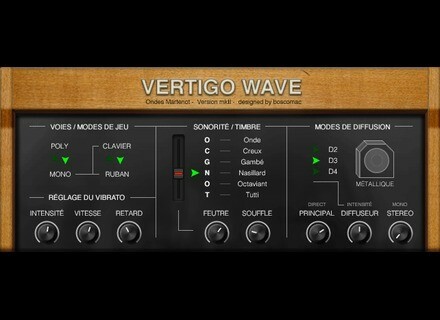 The Vertigo Wave user interface has been revamped in this mk2 version and Boscomac added new controls, so you can now choose between 6 timbres (Onde, Creux, Gambé, Nasillard, Octaviant and Tutti), three diffusion modes, three vibrato controls and the ability to add rose noise (Souffle) and filter (Feutre) the signal. Vertigo Wave mk2 for Reaktor is still available for free download from boscomac.free.fr. Spitfire releases Bone Phalanx Last November, Spitfire announces Phalanx, a new brass collection for their British Modular Library. The Bone section has been released today. Friday’s Freeware: Rhythmic Gate Alex Hilton provides us with his vision of the sequenced gate with a new free plug-in for Mac OS X and Windows. A new brass collection at Native Instruments Native Instruments collaborated with Soundiron to design un dual brass sample library that can be purchased separately or bundled.